As the saying goes, “If you want to create change in the world, close your eyes really tightly and pretend it doesn’t exist.” What, that’s not how it works? You mean, in order for people to make an informed decision about an issue and possibly work to improve it, we first have to be able to see what’s going on? Actually, that makes perfect sense and, you know what, musician Tony Kanal thinks so too. As No Doubt (the band responsible for such hits as “Don’t Speak,” “Just a Girl” and Gwen Stefani’s incredibly cool hair) continues on a tour of the festival circuit this year, Kanal has his sights set firmly on a major issue. Animal rights and the Ag-Gag laws that seek to undermine them. 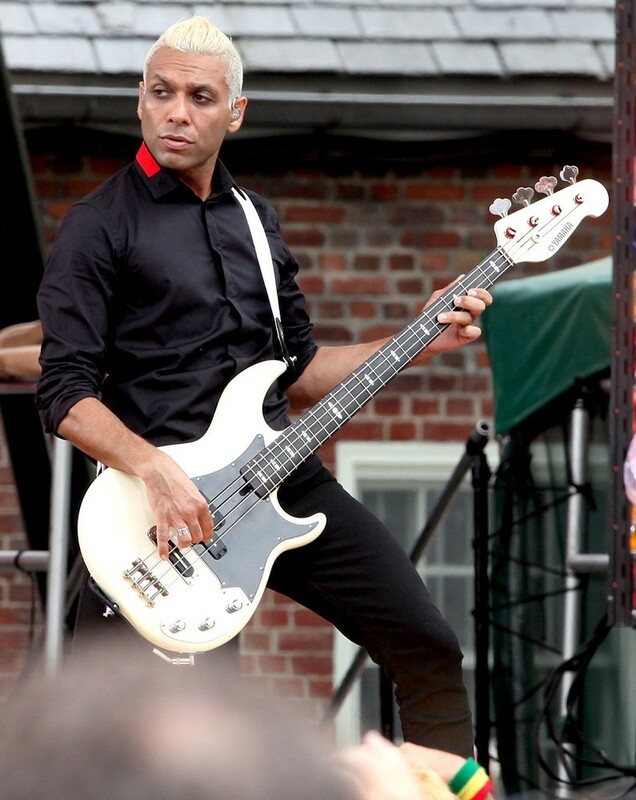 Tony Kanal, quite literally, rocks. A major animal lover, Kanal was a long time vegetarian. Upon the birth of his daughter three years ago, his worldview shifted and he realized that he no longer wanted to consume animal products at all. He went vegan and hasn’t looked back. After the connection was made, Kanal has become a tireless voice for animals, filling his Twitter feed with activism and his Instagram account with the fantastic vegan restaurants that he loves to visit when he’s on the road. From putting an end to poaching and the ivory trade to boycotting SeaWorld, there hasn’t really been an animal related issue he didn’t champion. Now, he’s teaming up with Mercy For Animals in order to participate in their #NoAgGag Campaign alongside other celebrities like Moby and Mark Pontius of Foster the People in order to raise awareness for the need to fight legislation that would limit or eliminate undercover investigations into factory farms. Since the 1990s, laws that criminalize journalists, whistleblowers and activists for recording or reporting on the activities that happen in factory farms have been growing in prominence. As of March 2015, there are seven states on the books with such laws while over 20 have proposed the legislation. By eliminating transparency and ostensibly closing the doors to the egg, dairy and meat production facilities that supply food, not only do we open ourselves up to allowing abuses within in an unchecked system, but we risk danger to human health. Without whistleblowers, how will unacceptable practices even come to light, let alone stop? Undercover investigations performed by activists are responsible for not only creating awareness in people who had no idea where their cheeseburgers, scrambled eggs and chicken nuggets were coming from, it gave them insight into how the animals who supplied them were housed and treated before slaughter. Kanal believes that this is vital to ensuring the industry isn’t allowed to continue the way it has. “Undercover investigations are really important and without them there is no way of knowing what’s going on. There are no governmental bodies that protect farm animals and these undercover investigations are all we really have,” he says. A recent Gallup poll shows that his sentiments are dead on. Of those Americans polled, 96 percent felt that farm animals should have at least some protections against harm and exploitation while 62 percent felt that strict laws are needed to achieve that end. Taking the family for some sanctuary time. Without voices themselves, animals will continue to be exploited without the strength and conviction of those who would stand up for them. Thankfully, there are caring people like Tony Kanal who lend their own voices and the power of their celebrity to shed light on the importance of transparency in the hopes of preventing and ending cruelty. Keep rocking steady Tony! Thank you for being such a tireless advocate for animals and showing the world how easy it is to #EatForThePlanet and make a positive impact with your food choices!